other information Patrick D'Arcy PDM001, 2012. 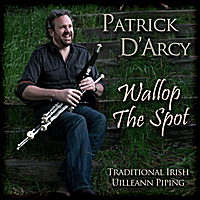 The following source information comes from an e-mail from Patrick D'Arcy to me on 25 October 2012: Recording took place between 7 March 2012 and 15 May 2012, in Bryan Dobbs Studios, Van Nuys, California. The album was released on 15 August 2012. 8 1 Song Raibh Tú ag an gCarraig? 13 1 JigSl My Mind Will Never Be "Aisy"